Industrial and Organizational Psychology: Perspectives on Science and Practice (IOP) is a peer-reviewed scholarly journal published on behalf of the Society for Industrial and Organizational Psychology. 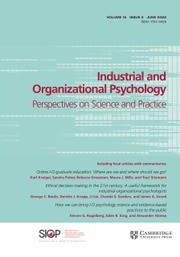 Industrial and Organizational Psychology focuses on interactive exchanges on topics of importance to science and practice in our field.The journal features focal articles which present new ideas or different takes on existing ideas that stimulate conversation on an important issue for the field (or potentially a pair of papers taking opposite sides in a debate). The goal of focal articles in Industrial and Organizational Psychology: Perspectives on Science and Practice is to present new ideas or different takes on existing ideas and stimulate a conversation in the form of comment articles that extend the arguments in the focal article or that present new ideas stimulated by those articles. The New Era Workplace Relationships: Is Social Exchange Theory Still Relevant? The purpose of the IOP Practice Forum is to advance the understanding of effective practice of industrial-organizational (I-O) psychology through the publication of original manuscripts focusing on I-O practice issues. The Forum provides practitioners with an outlet for communicating and/or learning about current trends, lessons-learned, best practices, effective practice principles, relevant issues, different points of view, and implementation challenges, associated with practice in I-O psychology.